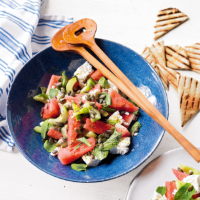 Refreshing watermelon and cooling feta make a great combination in this quick and easy Summer recipe. 1. Mix together the melon, feta, pumpkin seeds, cucumber and mint leaves. 2. Whisk the oil and vinegar together and season, then toss into the salad. Serve with the griddled mini pitta breads.